Yesterday I purchased a pair of medals awarded to William Brooks Featherstonehaugh. The surname is pronounced "Fanshaw " , which is odd, but the English love this sort of thing to trip up the unwary foreigner or member of the lower classes. His medals were a BSA Co. medal ( 93 reverse with a 96 bar) named up to Trooper. Raaff's Column. This was only part of the story as the rolls reveal that he was a Trooper in the BSA Co. Police on the 1890 Pioneer Column and although entitled to the 1890 medal, he never claimed it. The roll also showed that he was also on the roll of the MRF and he was a Sergeant in Roberson's Cape Boys. His QSA ( bars CC and SA01) has him as a Trooper in Cullinan's Horse. His service number was 1, but Sgt. John Carr had the same service number, so I'm not sure what went on with the Admin. of the unit. ots of research to be done. Any assistance would be gratefully appreciated. Not much on him yet Mike - but here's his father's Death Notice (1901) Swellendam, Cape Colony. Your man is the 3rd of a long list of children. Unsure whether or not he was born in 1864 in Somerset or in and about the same year in SA. That gives a little context to the origins of Bill Fanshaw ( as his mates would have called him after the initial explanations and bemused expressions) . 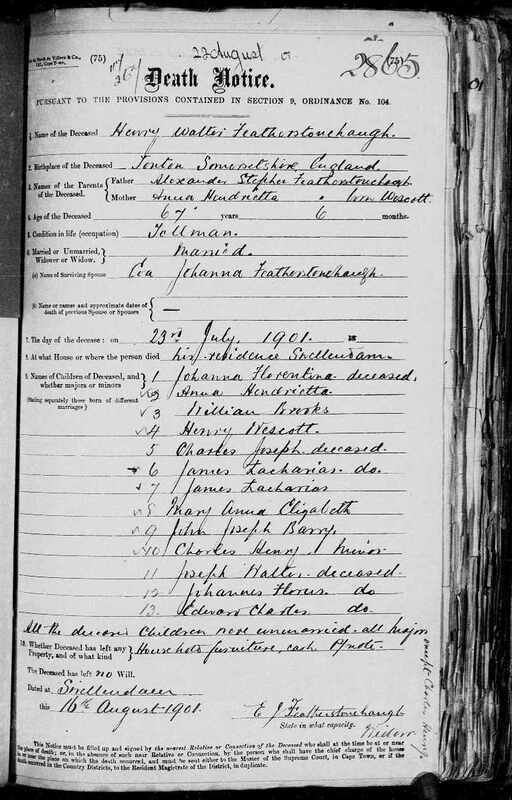 Looking at the names of mother and her female children, I guess that his father had married a girl of Dutch origins. I wonder if the Cape Archives has anything. Only the two references for WB that I told you about Mike - the Claim for Compensation file will be your biggest friend apropos his movements and antecedents. The surname is pronounced Fanshaw, really, I doubt that very much. mike rowan wrote: Yesterday I purchased a pair of medals awarded to William Brooks Featherstonehaugh. The surname is pronounced "Fanshaw " , which is odd, but the English love this sort of thing to trip up the unwary foreigner or member of the lower classes. He appears to be shown in WO100/240 as 321 Private, Special Cape Police.